"This is a great salad to serve for any autumn meal." Preheat the oven to 350 degrees F (175 degrees C). Spread the walnuts out on a baking sheet in a single layer. Bake for 8 to 10 minutes in the preheated oven, or until lightly toasted. In a food processor, combine the cranberries, vinegar, onion, sugar, and mustard. Puree until smooth; gradually add oil, and season with salt and pepper. 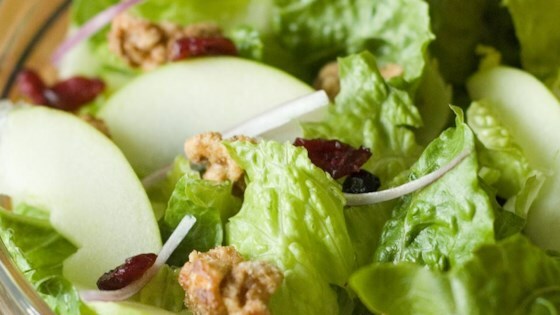 In a salad bowl, toss together the greens, apples, and enough of the cranberry mixture to coat. Sprinkle with walnuts, and serve. Delicious. I doubled the cranberry and caramelized the apples.